Utilizing a multi-color printing process, the keys are color-coded and heat fused to ensure long lasting durability. No chips or cracks. KB Covers keyboard covers safeguard your keyboard from dirt, spills and wear and tear, allowing you to protect your investment in your Mac. 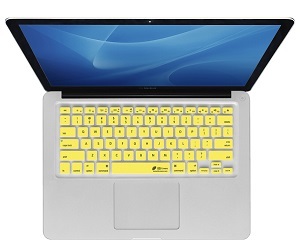 The keyboard covers are hand washable and easy to keep clean. Made with the highest quality silicone, KB Covers are ultra-thin, precision fit to your keyboard, so they will not slip or slide. In addition, KB Covers have a silky smooth feel so they are soft and comfortable to the touch and will not restrict typing.